Mobile Computer Workstation - Adjustable, Modular, Ergonomic is a modular system of components that when combined create a versatile range of mobile or static environment. 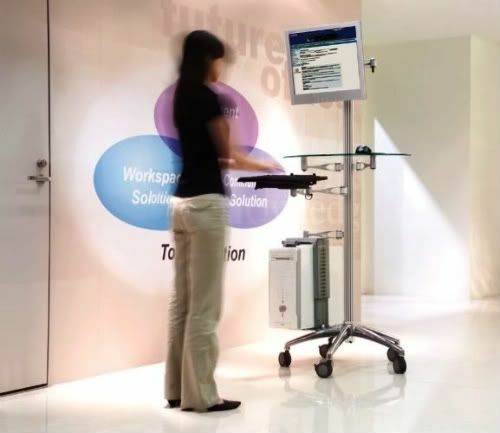 The mobile workstand includes the dual-arm LCD mount bracket, a tempered glass mouse/desktop shelve, an ergonomic keyboard arm and tray, a secured all-size CPU or UPS holder and a printer or paper stand. The computer pole stand has 68.9” (175cm) overall height and it’s fully mobile with 2 locking and 3 non-locking casters. The LCD monitor mount is VESA compatible 75x75 to 100x100 with weight capacity of 22lbs (10kgs). The mobile workstation is constructed of lightweight yet durable aluminum and steel materials. It's ergonomic, portable, space saving attributes and high-tech look make it an attractive choice in all types of businesses, office, trade-shows, mall kiosks, retail stores, factories, band, schools, hospital, internet cage and even at home. All parts are 100% height adjustable. Please note that monitor, keyboard, mouse, printer and CPU are not included. If you need to customize with more or less attached modules for this workstation, please feel free to contact us at (888) 891-9321 or via email at sales@cotytech.com. Approx. 32" wheel diameter, convenient to move through doors. Cable ties or clamps along pole and arms for neatness. Semi sphere tempered glass platform diameter: 28"
Moves to accommodate multiple users, sitting or standing. Q: Can I put additional monitors on this workstation? A: Yes you can by addtion either the 21"-long arm or the short arm.